We use Niobium-Aluminumoxide-Niobium (Nb-AlOx-Nb) Superconductor Insulator Superconductor (SIS) tunneljunctions as heterodyne mixers. 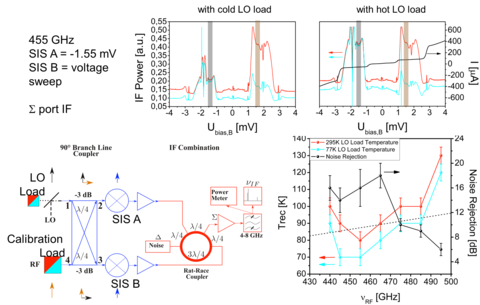 SIS junctions have a highly non-linear IV-characteristic and are capable of quantum limited mixer performance. 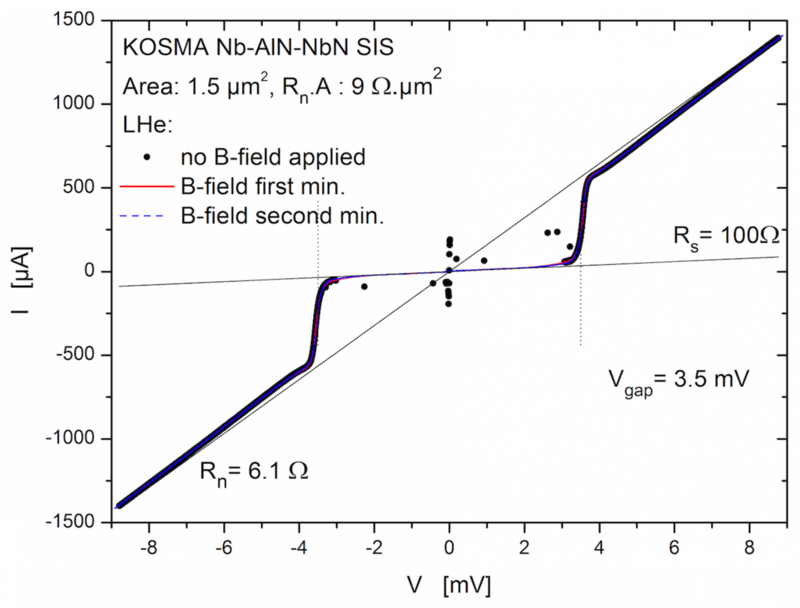 The performance of SIS mixers is well understood and described in various review papers. The frequency range where SIS mixers can be applied is limited by the superconducting material of the electrodes.The critical temperature (Tc) of the electrodes (9.2K for Niobium) is related to the gap frequency (fgap) of the material ( fgap=3.5Tc.kB/h, BCS theory), which is around 700 GHz for Niobium. Above the fgap the photon energy is larger than the "binding" energy of the Cooper pairs and the electrodes loose their superconducting properties under radiation. Because an SIS junction contains its non linearity up to the sum of the gap frequecies of both electrodes, the Nb-AlOx-Nb junction can theoretically be used to approximately 1400 GHz (in practice somewhat lower). Our group develops SIS mixers for several applications and THz frequency ranges. 280-380 GHz mixer device DC IV-curve with two SIS junctions in parallel. The IV curve without coupled 0.35 THz radiation is shown in black and and the curve with 0.35 THz radiation is in red, clearly showing the photon assisted tunneling steps. Cooper pair tunneling is suppressed by a carefully adjusted magnetic field in the plane of the junction. Photograph of a part of the device. The dark brown layer is the first Nb layer, the layer with the lightest color is 300 nm SiO2 on top of the first Nb layer.The more gold coloured layer is the second Nb layer. The 2 black dots in the vertical bar are the SIS junctions, 47µm apart. The quarterwave line connecting to the antenna (left) is 80µm long. To the right is the first section of the RF blocking filter. 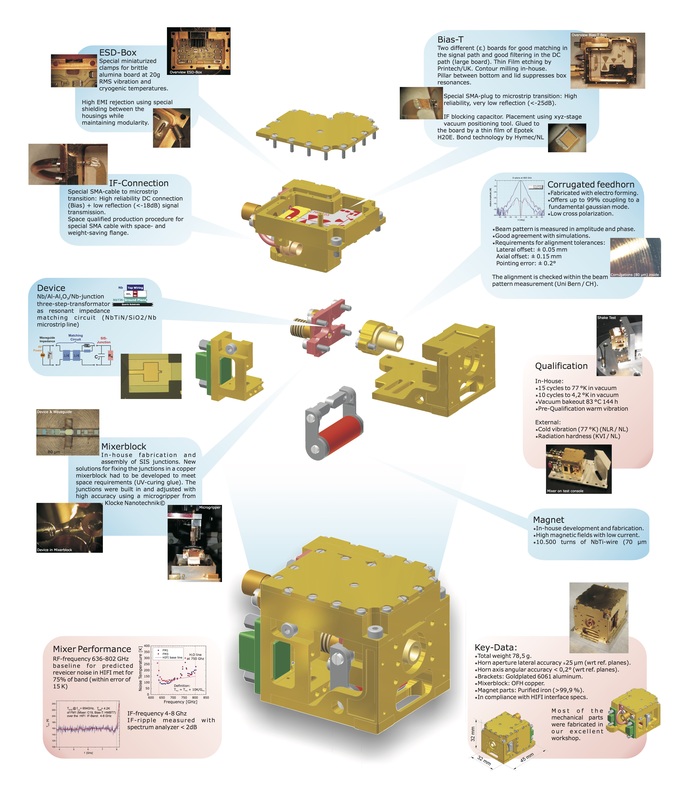 For ground based observatories (e.g. NANTEN2, APEX) below 1 THz more observing efficiency can be achieved by dedicated application of sideband separating techniques, by wider instantaneous bandwidths, and, most imporantly, by developing large focal plane arrays with many pixels .At these frequencies SIS mixers are the most sensitive mixers available and therefore a large part of our development is towards state of the art mixers (including e.g. side band separation) of a structural form that is suitable for focal plane arrays, and that can be fabricated in sufficient quantities. SIS junctions for mixers have an area of the order of 1µm2 and their specific capacitance is approximately 85fF/µm2. Our group develops predominantly waveguide mixers, where the free-space impedance of 377 Ohm is converted to a value around 40 Ohm. ( link to HF page). Due to the large capacitance of the SIS junction which is in parallel to the tunnel barrier, the impedance of the SIS junction at THz frequencies is below 1 Ohm, hence the necessity of a matching (tuning) circuit. In this frequency range we develop standard Double Side Band (DSB) SIS mixers. It is one of our first developments on Silicon on Insulator (SOI) substrates (link to clean room). The 9µm Si membrane device substrate is shaped by etching, which gives considerable more design freedom than with the earlier diced quartz substrates. 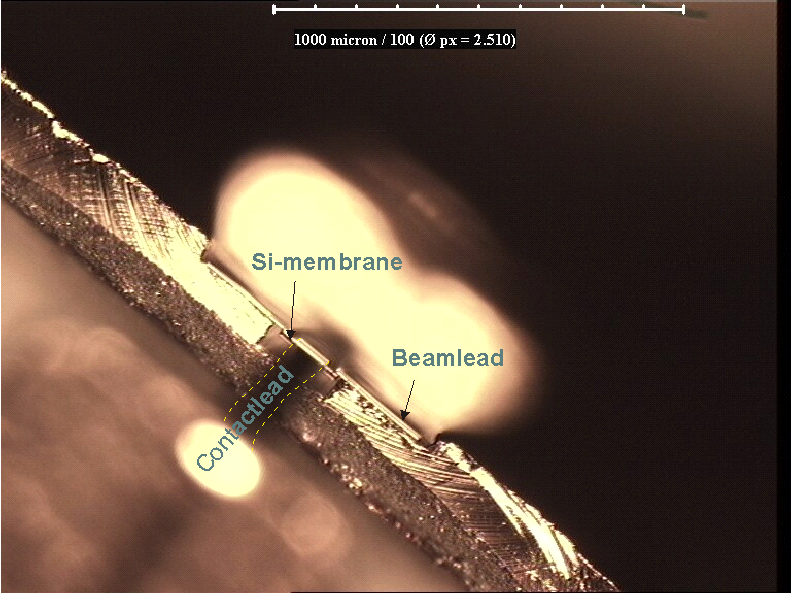 Contacts are made by beamleads (link to clean room) The sensitivity of the mixers, measured in a direct measurement including optics, is between 70K and 90K over the frequency band. The mixers are presently used in Laboratory Spectroscopy and in the labcourse SIS mixers. In this frequency band we pioneered the development of a balanced SIS mixer, with the complete critical RF circuitry on one silicon membrane chip (foto above). Balanced mixers need twice the amount of local oscillator(LO) power compared to single ended mixers, and are more complex, but they have the advantage that their signal coupling and local oscillator coupling ports are separate. This omits the use of diplexing optics, which is a significant advantage for focal plane array receivers. In addition the balanced mixer configuration suppresses the contribution of the local oscillator AM noise to the receiver noise, which can be substantial especially for high power LO's for arrays. 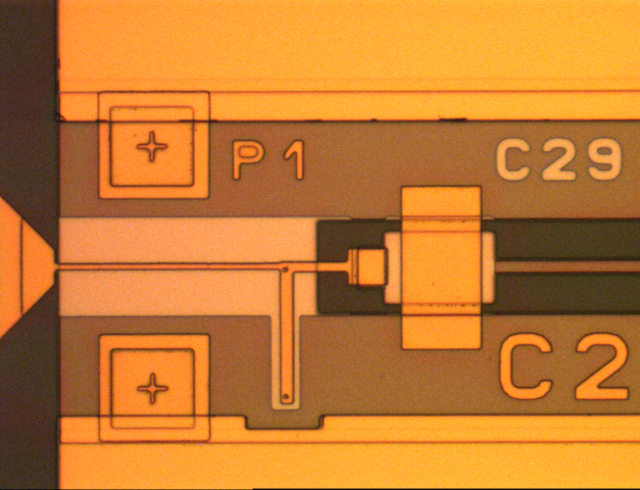 The chip is assembled into a simple waveguide block for signal coupling ( Horn) and bias connections ( including local oscillator power). This frequency range has the advantage that we can use the mature full Niobium process technology for the SIS junctions and for circuit technology, with 250nm SiO2 as the circuit dielectric. We make use of CPW transmission lines with dielectric (800 nm SiO2) supported bridges, both for the connection to the waveguide antennas and for the planar 90 degree branch line coupler. Balanced protoype mixer with IF Wilkinson power combiner between GPO output connector and ( small) RF chip. The curved channels up and down are the (splitblock) waveguides leading up to the signal horn and the LO supply. Balanced protoype mixer noise temperature as function of IF. The sensitivity of this balanced mixer is comparable to that of a single channel DSB mixer. To test the chips in a set-up that is more similar to a practical array mixer, they are used in a different mixerblock, with a Wilkinson IF combiner (Many thanks to J.Kooi for designing and supplying the board) built into the block, using only one IF amplifier and a relatively long waveguide feed for the signal. In this set-up the noise temperature is 100K, over a relatively wide IF band. Further developments go towards 2SB on chip mixers. 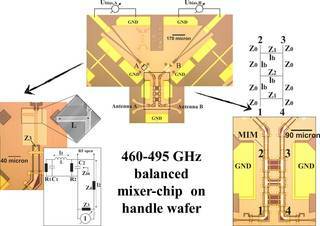 In a later stage, it is also planned to include the IF circuit part of the balanced mixer on the same chip in superconducting technology. Previous work in his frequency range includes the 8 mixers for the low frequency channel of the SMART receiver at NANTEN2. These mixers are DSB waveguide mixers with the devices on quartz substrates with noise temperatures between around 90 K in the lab. The difficulty of adjusting and operating the optical diplexer to combine the 8 signal- and local oscillator beams of the array before the mixers input, was an important consideration to start the development of balanced mixers. Our group has contributed the Band 2 mixers to HIFI on the Herschel satellite. For an exploded view of the HIFI Band 2 mixer please click. The mixers were designed, built and tested almost completely in house by a small team of 8 people including 4 PhD students. Our in house mechanical workshop provided timely, flexible and affordable (development of) fabrication of parts. The SIS junction technology is still Nb-AlOxide-Nb, but the RF-circuitry of the integrated tuning has a NbTiN groundplane. As the gap frequency of NbTiN is around 1.1 THz this provides a superconducting ground plane over the whole frequency band. Since the gapfrequency of the Nb junction electrode in contact with the NbTiN groundplane is lower, the quasiparticle transport cannot transport energy out of the SIS junction via this electrode, just charge ( Andreev reflection). To maintain the SIS device electrodes well into the superconducting state it is mandatory that energy, generated by the DC current and by the local oscillator current, can flow out with the quasiparticles, and we therefore cannot use NbTiN also as the top electrode of the RF circuitry. 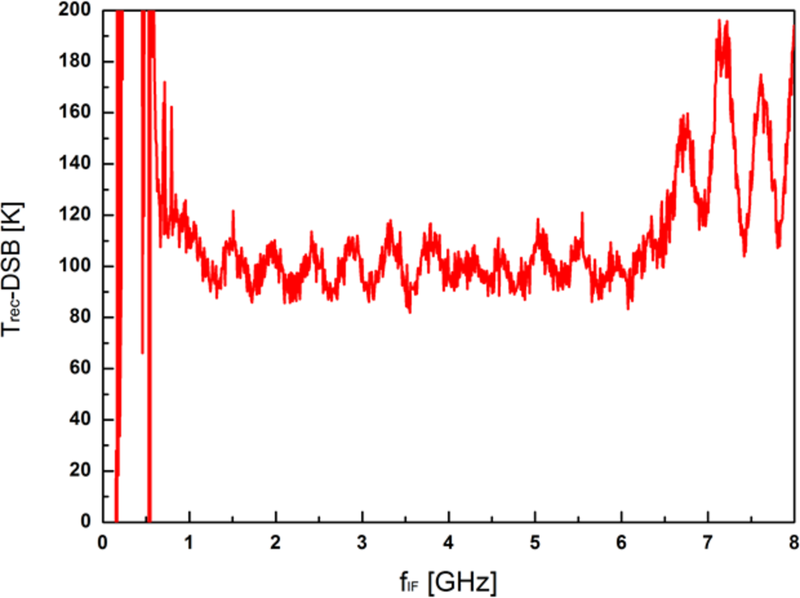 We choose Niobium instead, which has its gap frequency around 700 GHz. 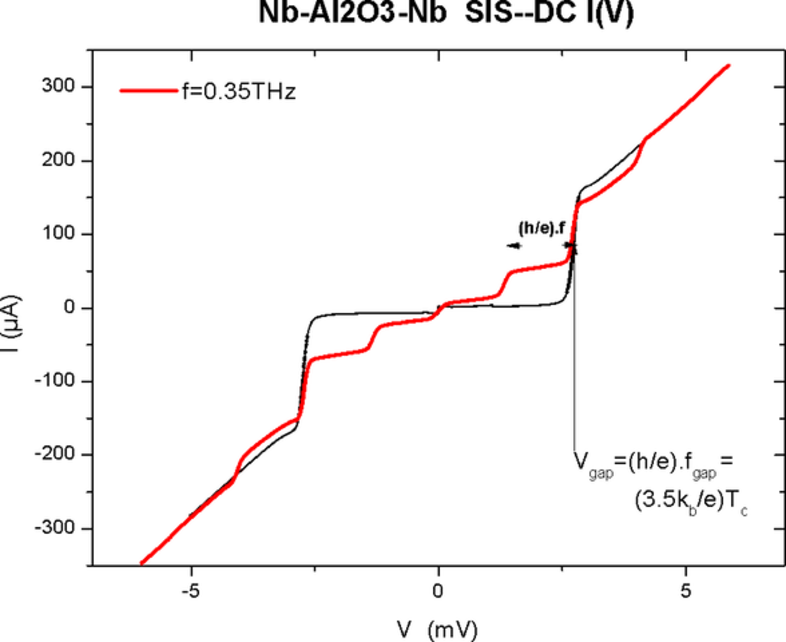 Above this frequency the tuning circuit will exhibit losses, which is clearly visible in the performance plots. Another possble choice of top electrode material would have been Aluminum, which is a normal conductor with an almost constant (low) loss over this freqency band. This would have made the performance of the mixer below 700 GHz about a factor of 1.5 worse, and the top 15% of the mixer band about a 20% better. Because of the better total average of the noise over the frequency band we decided to use Niobium instead of Aluminum. In this frequency range we provided the mixers for the upper channel of SMART. The technology is the partly the same as for the HIFI Band 2 devices, with Nb-AlOx-Nb SIS junctions and a NbTiN groundplane for the SIS integrated tuning. The upper electrode of the tuning is made of ( normal conducting) Aluminum because above 800 GHz normal conducting Aluminum has a better conductivity than non-superconducting Niobium. The noise temperature of the 8 SMART pixels is between 200K and 250K in the lab., tested in a single pixel set-up with a 23 µm Mylar beamsplitter. We are developing SIS junctions with a higher gap voltage and a higer current density. These SIS devices have an AlN barrier instead of an AlOxide one, that can enables a higher current density. The junction top-electrode consists NbN which has a ciritical temperature around 14K, enabling a sum gap voltage of 3.5 mV. A higher gapvoltage increases the upper frequency limit of the SIS mixer and the higher current density enables a more efficient and more broadband RF-matching. SIS Mixer development is carried out within the Collaborative Research Centre 956, sub-project D3, funded by the Deutsche Forschungsgemeinschaft (DFG). The development of AlN barriers is also supported by the European Union’s Horizon 2020 research and innovation programme under Radionet4, JRA AETHRA.